Mounted basins are sometimes known as ‘cameo’ basins or ‘sit-on’ basins, because they are placed directly on top of a cabinet or surface rather than being inset or fitted. 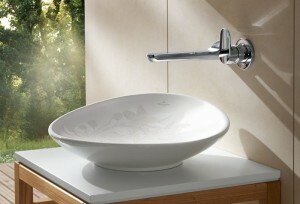 This stunning style of basin comes in an enormous range of options and materials, and can be mounted on many different surfaces. 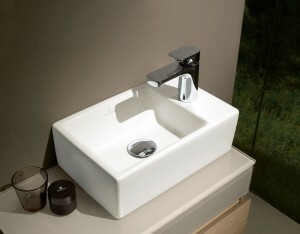 A basin is an integral part of your bathroom, whatever size or style of your room, and it should be beautiful as well as functional. There’s something very elegant about a cameo basin, almost as if it were simply placed there rather than being a fixture. This style works wonderfully both with a vintage theme of décor as well as modern or minimalist interior design. In fact, sit-on basins can be incorporated into almost any style of bathroom, and can create a central feature in the room. 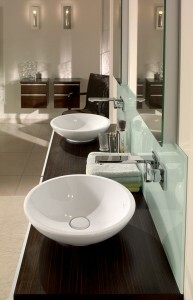 A mounted basin like this can be fixed to any surface, including shelves, cabinets, tiles, vanity units or even tables. The beauty of this arrangement is that you can incorporate a special or unorthodox piece of furniture into your bathroom design and not be constrained by traditional basin fixtures. Some popular choices include granite, glass or marble surfaces, which give a real sense of space – perfect if you want to have two basins side by side. With options in a variety of shapes and materials, you will easily be able to match your basin with the rest of your interior design, and fittings. 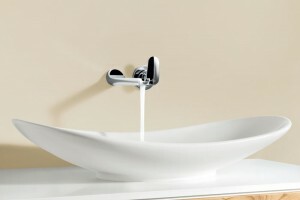 Taps can be either mounted on the same surface as the basin, or extend out from the wall, increasing space and providing a clean and neat look. Some newer styles are illusionary, making it seem like the water appears and disappears from nowhere, or are backlit, adding to the luxury and quality of your bespoke bathroom design. To discuss what basin options might be right for you, and for help creating your perfect luxury bathroom or wetroom, contact us at Concept Virtual Design. This entry was posted in Luxury Bathrooms, Luxury Interior Design and tagged bespoke bathroom, bespoke interior design, cameo basin, luxury basin, luxury bathroom, luxury interior design, mounted basin, sit on basin. Bookmark the permalink.